Have you ever felt or been told that you're acting a bit batty? Well, before you go completely mental and lose your grip on reality, you need to grab a hold of some decorations that will help to make your home a reflection of yourself. After all, they say one's home is supposed to be a reflection of one's personality. So if you want to give someone an accurate peek this String of Bats is a great start! You'll have over sixty inches of bat covered string to hang where ever you want. Got a bare belfry somewhere on your property? Perhaps a staircase leading down into a mysterious dungeon? Even just an ordinary everyday kind of entryway? All of these are prime examples of places to hang this 'batastic' décor, really there are no limits. If you wanted to you could even add this to your costume. Planning on being a symbol of fear and justice or a blood-thirsty vampire? This String of Bats would complement your outfit nicely. 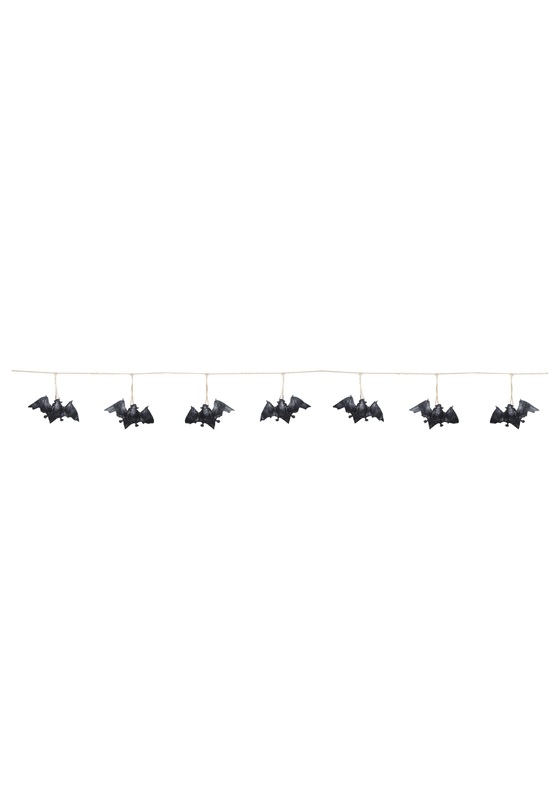 So, decorate your home or yourself with this awesome string of bats and let all your friends know just how batty you can get!